When I left Birmingham School of Music in 1980 I had decided to make and repair violin (family) bows as a means of earning a living. I can only attribute such a mad scheme to the ‘confidence of youth’ as without a properly equipped workshop, without a good stock of materials and without serving a proper apprenticeship I should have reconsidered. But the government of the time (whom I loathed, and still do in retrospect) were promoting ‘self employment’ and it seemed there might be a place for me. I told my local, well established repairer (Jack Stott) about my plans and he was delighted, particularly as he never found Hill bows easy to rehair! By far the greatest contributors to my eventual success were my parents; they allowed me to build a 10 x 6 insulated and heated shed in their newly acquired garden while they set about landscaping it. My mentor, Arthur Bultitude, had exactly the same size lean-to workshop on the back of his bungalow in Hawkhurst, so I figured if he could work (and what fine work!) in such a space, so could I. Empty, it seemed quite large….. This was not my first bow, however. 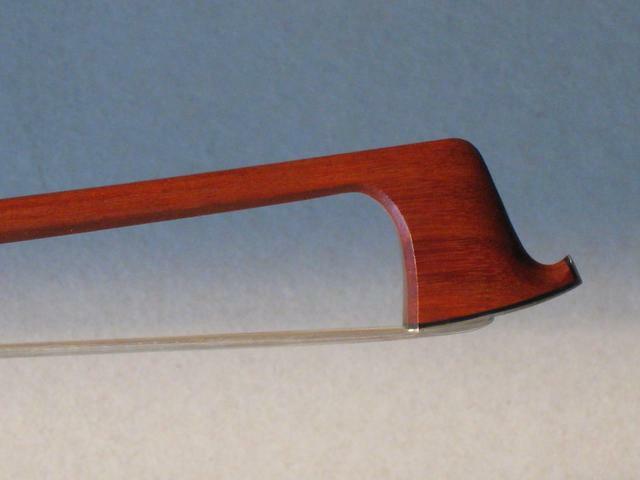 I had attempted a copy of one of Birmingham Conservatoire’s Dodd items, a viola stick, in 1978. The wood I used, a blank gifted to me by Jack Stott, was brazil wood - Massaranduba, not pernambuco – and reducing it to Dodd dimensions was a disaster as far as good playing characteristics were concerned. But it took hair and played; the nut (‘frog’) was a German made item from David Evans’ shop in Birmingham. 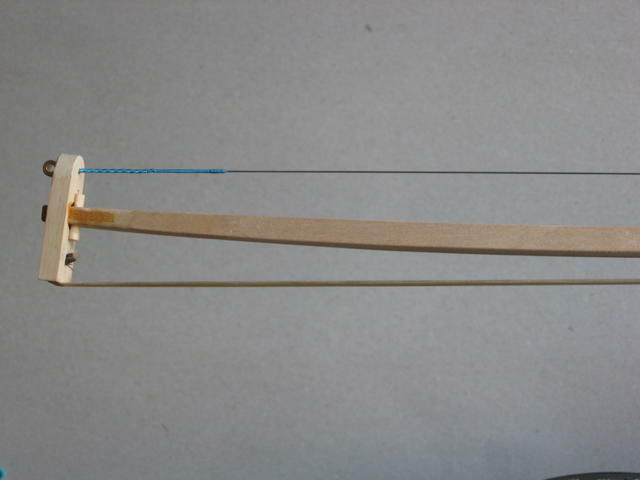 I still have the bow and regret having subsequently used it for various development experiments early in my bow making career! 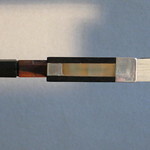 My second year teacher was impressed enough to ask me to make a violin bow for him, but I cannot recall what I made the stick from, and I assume he gave me a nut (or I bought a ready made one again) because I wasn’t able to do silver soldering then, essential for making ferrules. It would not have been stamped with a metal stamp bearing my name, instead it may well have it in ink. The whereabouts of that bow are currently unknown. The bow pictured here though is the first I made completely, with the exception of the screw and brass eye. It was made in my new Bournemouth workshop (note, no longer a ‘shed’!) during the Spring of 1981 for my own requirements, as I intended to play and teach the viola as a secondary income. The bow would be my calling card, as proof of what I could do. Unashamedly made on Bultitude principles (I drove to Hawkhurst in my Triumph Spitfire for bow making tuition) it is interesting to see how it differs from his work though, and I can’t recall any other model influencing me at the time. 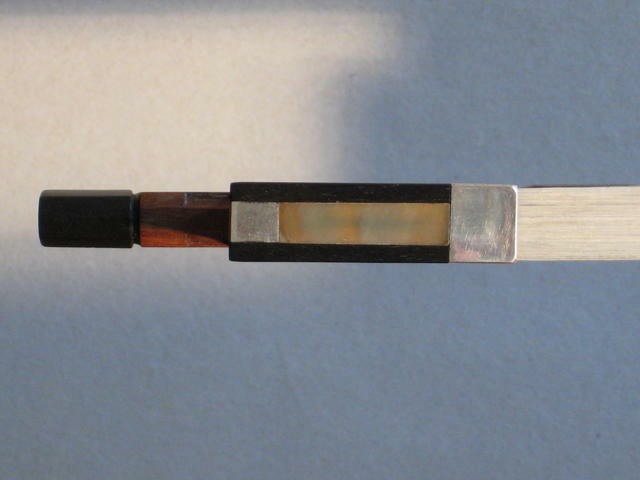 Note that the tip (adjuster) is just ebony, with no rings – I hadn’t learnt how to make them and although I had a very basic lathe it wasn’t capable of the work needed; hence no inlay in the nut sides, either. I showed it to Mr. Bultitude and he encouraged me to somehow acquire a good electrically powered lathe, as the quality of English bow making depends on such a tool. For those of you interested in such things, his lathe (like Retford’s) was a pre-war German ‘Lorch’ whereas I went for the English ‘Myford’. To raise the money, I sold my beloved car. I went back to the Dorset Youth Orchestra in the summer of 1981 because they needed a viola player (and my then girlfriend was in the orchestra); my desk partner and I swapped bows, as you do. He expressed an interest in buying my bow, and at that stage in my business how could I refuse? I reasoned that I could always make myself another one. With the money, in August 1981 (the amount, £65, seems laughable now) I was able to buy more pernambuco wood, ebony, ivory and silver. 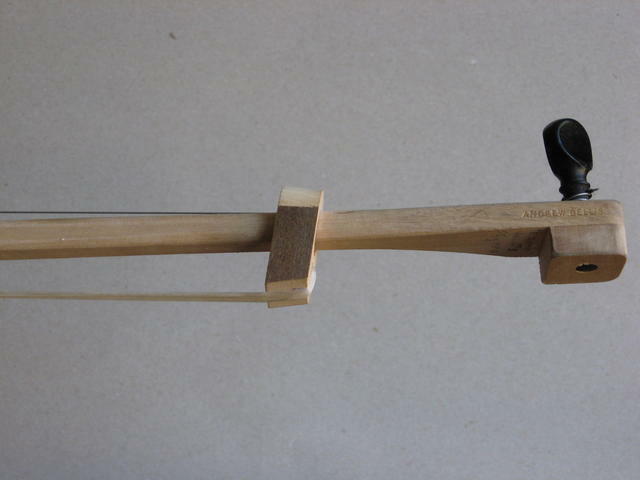 The next bow I made for myself was fully mounted, ivory and silver; of course, in turn, it was sold after I let a professional player borrow it while I rehaired his own bow. For the last 30 years my ‘first’ bow has been in the possession of its first owner, though we stayed in touch and he told me he was no longer playing. I said that if he ever wanted to sell it, could I have first refusal. So here it is, as a testament to the enthusiasm of youth and mainly to the excellent teaching of Arthur Bultitude, England’s finest bow maker after his teacher, William Retford, author of the excellent book 'Bows and Bowmakers'. Unknown to me then, Retford used to holiday in Bournemouth about half a mile from my parent’s house near Queen’s Park. It has, ever since I completed that bow and realised how well it played, been my aim to reintroduce the quality of work that was done privately in the 1950’s and 1960’s to the players of today, with the great fortune that I am a player and know what is needed. The best work of that time, from W. C. Retford, A. R. Bultitude (though not their work for Hill’s) and P. W. Bryant, is without equal and worthy of better study and appreciation today, particularly from those who are, maybe, slaves to fashion more than they should be (I cite the latest trend for so-called ‘Lafleur’, or swan-style, heads on violin bows with their inherent weakness). 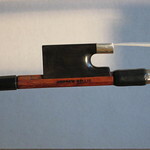 At the risk of being boastful, I’m surprised at how good this bow works – it has that lovely ‘double cream’ feeling of clinging to the string and not letting one down in slow bows (anything can do fast bows) which is, I believe, the essence of lush sound. For me to have achieved that aged 23 is in retrospect most pleasing, so if you want an affordable bow and know any young, assured, well taught and determined bow makers who play and are just starting in their careers, don’t hesitate to help them on their way! No tip rings and no inlay in the nut. 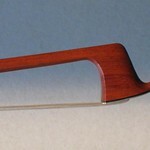 The excuse for the ebony tip is a Thomas Tubbs bow pictured in Retford's 'Bows and Bow Makers' (plateXI), but it must be appreciated that such construction is vulnerable if aggressed (usually by dropping onto a hard surface) and it will split off the screw, hence the usual addition of rings. Without a lathe, it was not possible for me to make them correctly. 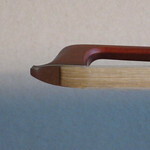 As for a lack of inlay in the nut sides, James Tubbs probably made more bows without than with. The head is metal faced in the Tubbs/Hill tradition. Perceived to be stronger than ivory, it can lead to great problems if it is damaged, whereas an ivory face can be replaced. A metal face can actually contribute to a head breaking off by transmitting the shock to the head, instead of breaking as an ivory face does. Unless I am making a copy, I hardly ever fit metal faces now. 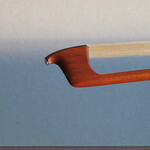 The stick is octagonal (more for ‘show off’ workmanship than for playability!) and the way it fades into the head is individual to every maker. Even copying another maker, they usually give themselves away there – perhaps no bad thing. Ohh, the length of that ferrule! Very James Tubbs, but I hadn’t seen an unspoilt example of his wedgeless ferrule then. Tubbs copies I make now have that feature because it works so well; hopefully they will not be rehaired by handymen. The slide is awabi flake (though the camera hasn't picked up the colours in it), my first batch purchased from Freidleins in London, long gone as their business was gradually eroded by items being banned from trade (ivory was banned in the U.K. in 1989). One time I went there the manager challenged me to lift up a sawn-off elephant tusk (“if you can carry it out of the door you can have it for free”), and had a good laugh when I couldn’t even get it off the ground. 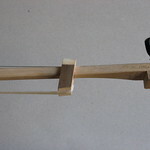 The nut is fitted to the stick by the ‘traverse’ system, where little rails are cut into the stick to take the nut. It both avoids making a metal lining (I hadn’t learned how to do that either, or made the special jig it demands), and results in a very cozy fit of the nut to the stick, avoiding the annoying ‘rolling’ that the (almost) ubiquitous three-sided lining system promotes. 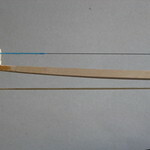 It is however much more time consuming to make, hence Hills gradually eliminated it from their top end bows. 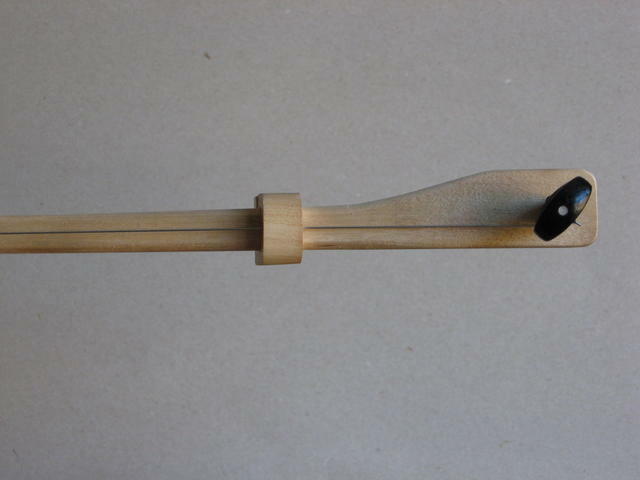 Ironically, it had been suggested to them by a young French apprentice bow maker who worked at Hills for a short time, maybe as his version of the Vuillaume nut to stick fitting, which is horrid. Note to photo 6. 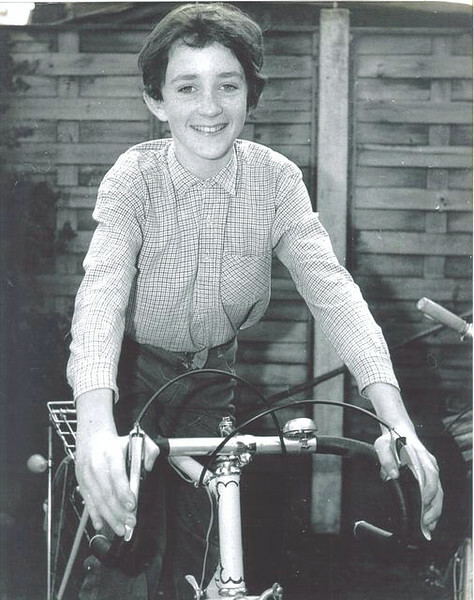 Myself on my 1949 lightweight cycle, the frame by Hobbs, at the time when my father gifted it to me as my first ‘real’ machine, about 1969. To accent the point I made above; despite all the ‘advances’ in technology, it is not possible to better that (now nearly 70 year old) cycle, because it was made with great skill from fine materials. I don’t want an aluminium cycle made in the Far East (though they are lightweight, the ride quality is unacceptably harsh if you’re going any distance, which is the whole point of having a cycle); and I don’t want a carbon fibre one either, because I’ve seen them after they have broken – not a pretty sight, and very few of them accept mudguards and luggage racks. So there!! In the early summer of 2011 I was invited to take part in a project where a complete symphony orchestra of instruments made from scrap or recycled materials would be capable of playing Tchaikovsky’s 1812 overture at a Prom concert. It didn’t turn out quite like that, because the orchestra was reduced from normal size (strings 6–6–4–3–2 for example) and the music was arranged to both suit the reduced orchestra and be shorter in duration, but the essence was still there – all the normal instruments were needed. 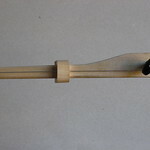 I shared the bow making half and half with Peter Oxley. Initially I submitted out-curved bows made from old fishing rods and recycled aluminium and plastic tubing, but these were all too short because the players found the violins difficult to play (if you have seen the programme you’ll have picked that up) and needed all the help they could get from the bows, which meant going to traditional length and weight, as far as possible. 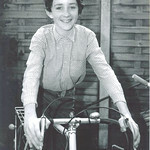 Hair was also a problem – for the programme makers. I tried to justify the use of horse hair (as normal) by saying it was already recycled, as the horses it was taken from had presumably led a useful life. They wanted to pursue the idea of alternative hair (which involved using new, unused, synthetic materials) all of which were useless, neither being long enough nor capable of taking rosin. Eventually we were allowed horse hair, as the violin makers were allowed ‘proper’ strings. One bow that did make it from the very first filming day in a scrap yard near Peterborough to the Royal Albert Hall was the now famous ‘coathanger bow’ that one player fell in love with and couldn’t be persuaded to change for a longer bow. It did a rather good job of the reflex ricochet bowing towards the end of the piece. Sorry, no photographs of that (it’s the property of the BBC now), but I think you know what a coathanger looks like, and the hair was just a hank stretched across the widest point. 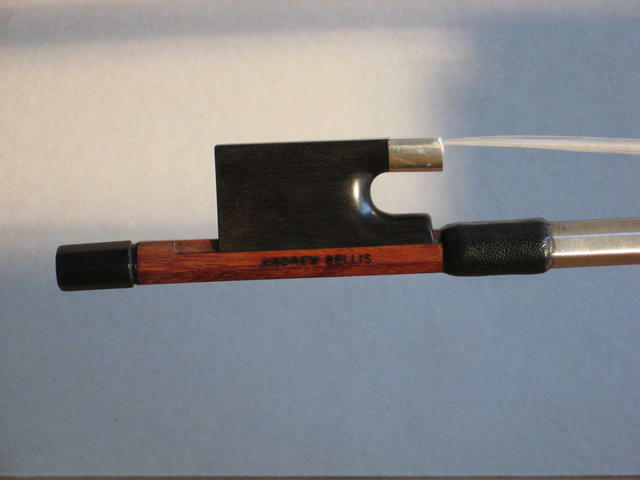 The double bass bow was made from a piece of waste water pipe with the (black) hair under permanent tension – and I honestly didn’t know it was going to be paired with a bass made out of a tin bath. 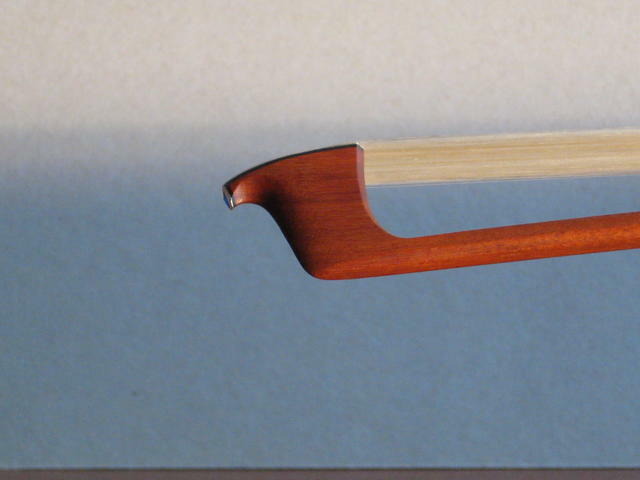 Pictured above is the final design for the upper strings that went into production, using a wood for the stick (ramin) sourced from a 1970’s G-Plan wardrobe. 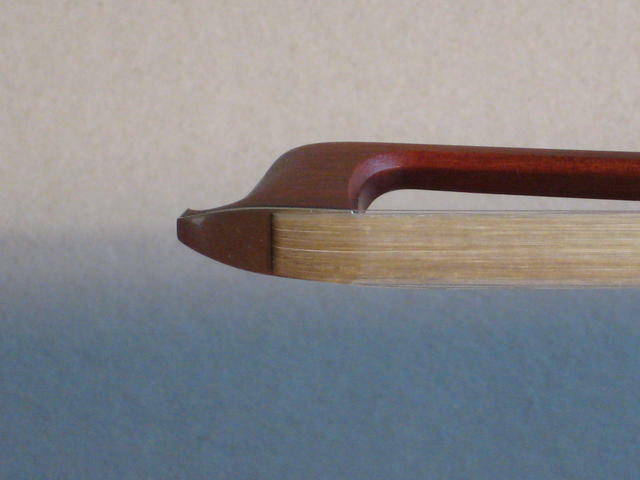 The inward curve, for the hair to pull against, is artificially put in by a broken cello A string on top of the stick, kept at tension (and adjustable) by a discarded violin peg at the heel. The hair, a usual amount, is attached to the stick by ‘carriers’, the head one fixed in place, the lower one acting as a sort of frog by being movable along the stick though locking itself when under tension. To witness my simple, rather avant-garde ideas being accepted and played in a Prom concert gave me great joy and I met some wonderful people both in the orchestra and ‘behind the cameras’. Thank you everyone!